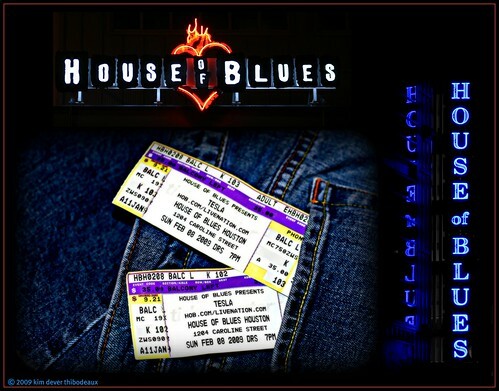 Sean and I attended a Tesla concert at the House of Blues in Houston on Sunday, February 8. No cameras allowed. Boo. Hiss. So after the concert, we returned to the car. I got my camera out and had Sean drive me back to the H.O.B. and drop me off so that I could get some shots of the neon signs while he drove around the block. I had never shot photos after dark, so I winged it hoping things worked out. I also shot some pics of the front doors since the door pulls create the H.O.B. flaming heart logo and it was February, after all. You know...Valentine's Day. When we got back to the hotel room, I decided to try out the Canon EF 50mm f/1.8 lens I had bought the day before at the Houston Camera Exchange - a wonderful place for all things photography. Anyway, I laid my jeans on the coffee table and stuck the tickets in one of the back pockets. When we returned home I was pleased to learn that my neon sign shots were terrific and the tickets pics were exactly what I wanted. I selected my favorite ticket pic and tweaked it with Picnik so that the colors were bright and glow-y like the neon signs. Then I combined the tickets pic and two neon sign pics to create a collage as a remembrance of a wonderful weekend with my husband. Here are some more photos I shot that weekend.